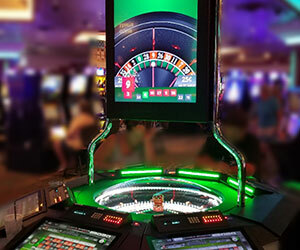 Specialty games, including: Let it Ride with 3 Card Bonus side wager, Super Fun 21 with Diamond Blackjack side wager, Lucky Ladies Blackjack and 21+3 Blackjack, Ultimate Texas Hold‘Em with Trips Bonus, 3 Card Poker PROGRESSIVE with a 6 Card Bonus option, and Bonus Craps! We are proud to offer some of the most liberal table odds offered in Laughlin, like triple odds on craps and double down on first two original cards in Blackjack! No need to pack your tux — our atmosphere is friendly and casual. Good luck!